The Energy Department has awarded a $2.5 million grant to the College of Science’s Center of Excellence in High Energy Physics. Team members are Professor Kaushik De, who directs the center; professors Andrew White, Andrew Brandt, and Jaehoon Yu; and Associate Professor Amir Farbin. 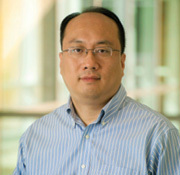 The National Science Foundation has awarded more than $600,000 to computer science and engineering Associate Professor Heng Huang to develop an interactive database of gene expressions of the fruit fly. Purnendu “Sandy” Dasgupta and Aditya Das have received a National Science Foundation grant to make an affordable field analyzer for arsenic levels in water. Dr. Dasgupta, the Jenkins Garrett Professor of Chemistry and Biochemistry, will direct the project with Dr. Das, senior research scientist at the UT Arlington Research Institute, and Scott Evans, president and co-founder of Chipotle Business Group. A research team has received a National Science Foundation grant to build an inexpensive device that uses nanotechnology and a simple urine test to detect tiny amounts of bladder cancer cells. Electrical engineering Associate Professor Samir Iqbal leads the group, which includes bioengineering Associate Professor Young-tae Kim and UT Southwestern urology Professor Yair Lotan.